The Grand Aquarium is located at Aqua City in The Waterfront zone. The place is remarkable, with a big water fountain in front of it. The fountain can dance by the music. You can escape to here for a moment from tropical heat outside. Starting out from the sunny sea shore, you will find the darkest depths of the ocean floor. At this point, you will be able to hear the power of the ocean as water roars through a blow hole. Vibrant corals undulate as you pass the spectacular tank and stroll through a beach adorned with sand sculptures. At the touch pool, children get hands-on experience with sea cucumbers and sea stars as they develop an appreciation for sea life with all 5 senses at an early age. 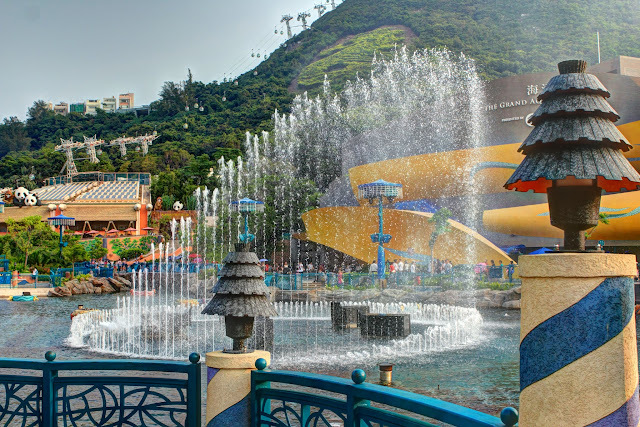 Ocean Park Hong Kong is a marine mammal park, oceanarium, animal theme park and amusement park, situated in Wong Chuk Hang and Nam Long Shan in the Southern District of Hong Kong. Opened in 1977 by the then Governor of Hong Kong Sir Murray MacLehose, Ocean Park has grown to about 35 attractions and rides. The park has won several awards, including The World's Seventh Most Popular Amusement Park and 33rd Most Visited Tourist Attractions in the World by Forbes. Covering an area of 870,000 square metres (210 acres) of land, the park is separated by a large mountain into two areas, The Summit (Headland) and The Waterfront (Lowland) respectively. Ingin mengetahui jumlah poin MCC secara gampang dan cepat? Keuntungan menjadi anggota MCC - Matahari Club Card.